As national home sales slide, falling 17% year over year in February, the attention shifts to British Columbia, Canada’s most expensive housing market. Despite the barrage of Government policies aimed at curbing the residential housing market, including, a 20% foreign buyers tax, a speculation tax, and an increase of property transfer tax, the market has remained surprisingly resilient. Since prices bottomed in November 2008 after the financial crisis, BC home prices have inflated 97%, peaking out In February 2016 at $779,419. As prices reached dizzying heights many defeated buyers gave up their aspirations for the detached market, and instead, feasted on the condo market. 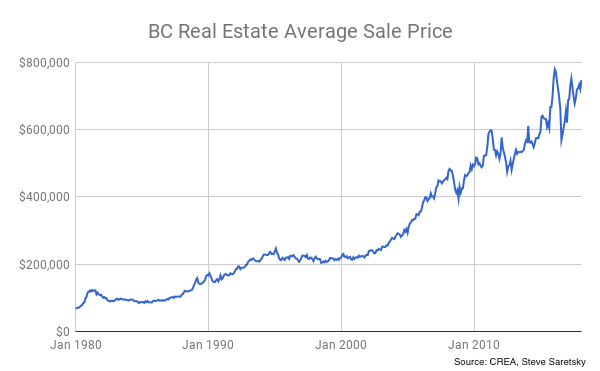 However, despite the red hot condo market, the total average sales price across BC has failed to eclipse it’s 2016 peak. As of February 2018 the average sales price sat at $748,149 a 9% increase from February 2017 but 4% below 2016 levels. The resulting decline of the average sales price falls in line with the decline of total dollar volumes, which have sunk 38% from February 2016. It would appear the glory days of irrational exuberance are in the rearview mirror. At least in the residential space. Avison Youg is reporting the value of British Columbia’s commercial real estate sales last year smashed the record set in 2016 by an astonishing $3.4B. Total investment into BC commercial real estate hit $7.5B in 2017, up from $4.1B in 2016. Join My Weekly Newsletter Here.